The sun continues to rise and we start to feel the heat. It is late September and you can tell by this autumn day that any midsummer day would rival those 100 plus degree days in Texas. During the Roman period Ephesus had a population of about two hundred thousand people. I remember from another journey that Tenochtitlan, the capital city of the Aztecs, had a population of about two hundred thousand prior to the conquest. Florence at the time, which was considered the thriving center of European Culture, had a population of only twenty thousand. Ephesus, like Tenochtitlan, was about ten times larger than Florence. We follow he guide down the gravel spur. She mentions that the flat area across from the palace was the agora (market place). It is not much to see. I do not even take a photo. Then a broad street lined with columns and paved with marble slabs captures our attention. It is amazing. The entire group stands agape. 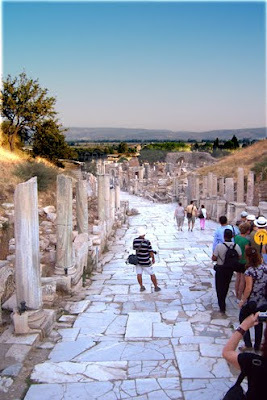 This is Curetes Street, which is the main avenue leading into the center of the city. We are eager to follow the lavish avenue, but our tour director stops us at the Peristyle House. At the time, it appeared to be another ruined Roman villa. Our eyes keep returning to the broad street paved in marble and lined with beautiful columns extending into the distance. What our guide does not point out is that this ruin has been reconstructed. I suppose due to time restraints, she decided to bypass it. Later I learn it is one of the most striking features of this ancient town. Much of the dwelling has been restored in all of its grandeur, including frescoed walls and lavish pools. I have pimped a photo from a guidebook that I purchased to show you. I have this realization about the Roman sets created by Hollywood in movies like "Spartacus or Cleopatra. "; the sets are no exaggeration. Many of these homes must have resembled Hyatt hotel lobbies. The lesson here is to purchase the gift shop guidebook before the tour starts and make sure all the key points of interest are covered. 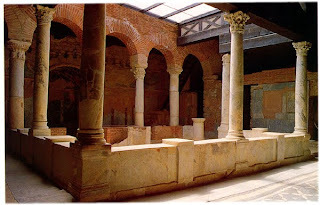 Interior reconstruction of Peristyle house. The center atria of the house featured a water filled pool surrounded by various rooms. The pool must have cooled and moistened the hot summer air. 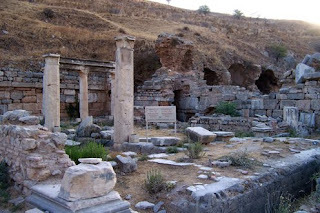 Water was plentiful in Ephesus. Several fountains, baths, and latrines service the city. Homes of the very wealthy had private plumbing, which is an extravagance almost beyond belief. The ornate corinthyian pillars, elegant arches, and intricate mosaics decorate the structure. Walls are covered with colorful frescos, often illustrating myths. This is truly a residence in which a 20th century family could live in comfortably.